The following is a list of the tallest players to ever play in the NFL that I am aware of. You generally have to be pretty big to play in the NFL and all of these players were at least 6' 9" in height. 1. Richard Sligh - 7' 0"
Defensive tackle Richard Sligh is the tallest player in NFL history with a height of 7' 0". To date, Sligh is the only player in league history to be seven feet tall. Richard Sligh did not have a long NFL career. After being drafted by the Oakland Raiders out of North Carolina Central in the 10th round of the 1967 NFL Draft, Sligh played in eight games for the Raiders in 1967, and then never played in the NFL again. 2. Morris Stroud - 6' 10"
At a height of 6' 10", retired tight end Morris Stroud is the second tallest player in NFL history. Stroud played for the Kansas City Chiefs from 1970-1974, and caught 54 passes for 977 yards and seven touchdowns. Stroud averaged a very impressive 18.1 yards per catch in his NFL career. T-3. Too Tall Jones - 6' 9"
The best defensive player on this list of tallest players in NFL history is Too Tall Jones, who played defensive end for the Dallas Cowboys from 1974 to 1989. The NFL did not officially start counting sacks for players until 1982, so Too Tall Jones officially had 57.5 sacks in his career from 1982 to 1989. Unofficially, Too Tall Jones had 106 career sacks. T-3. Jonathan Ogden - 6' 9"
The best offensive player on this list is Pro Football Hall of Fame member Jonathan Ogden, who is 6' 9" tall. Ogden played for 12 years in the NFL (1996 to 2007), and made the Pro Bowl 11 times. T-3. Dennis Roland - 6' 9"
Offensive tackle Dennis Roland is 6' 9" tall. 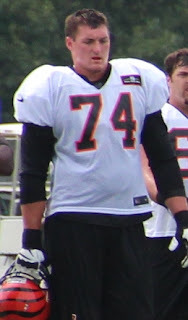 Roland (pictured above) played in the NFL from 2006 to 2013, mainly playing for the Cincinnati Bengals. T-3. Jared Gaither - 6' 9"
Jared Gaither, who is 6' 9" tall, was an offensive tackle in the NFL from 2007 to 2012 (he missed the 2010 season). T-3. Demar Dotson - 6' 9"
Demar Dotson is a tackle in the NFL playing for the Tampa Bay Buccaneers. Dotson played for Southern Mississippi in college and made the Bucs squad as an undrafted free agent. T-3. Jim Newton - 6' 9"
Tackle Jim Newton played in three games for the Indianapolis Colts in 2003. T-3. King Dunlap - 6' 9"
Some places list San Diego Chargers tackle King Dunlap as being 6' 9" tall. Other sites list him as being 6' 8", so he is probably a shade under 6' 9". Dunlap played for Auburn in college until he was drafted in the 7th round of the 2008 NFL Draft.